C. someone who thought, "what the hell is this post about?" Well, whatever your answer I'm glad you're here. And I promise, you will leave here knowing how I transformed a monster face to go perfectly with my Fall front door. 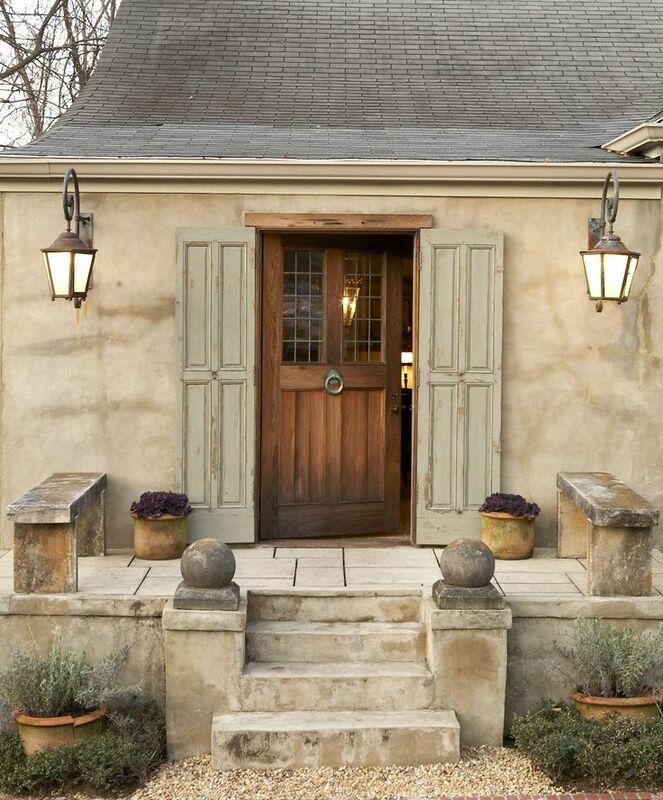 if you read my last post, you know that I'm guest-posting over at Hello Lovely Studio this coming week, and since Michele and her readers love the style of classic European homes, I had to think of a post they would like. 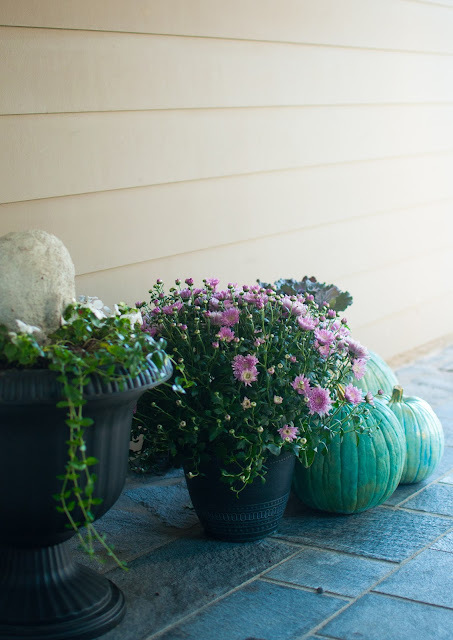 "3 ways to add French charm to your Fall front door." Meanwhile, welcome to 'classic garden statue' day. Here we go...so the big question I always have after I get one of my 'great' ideas is, "Can it be done?" Can I really make one of those aged, moss-tinged beauties that I envision when I think of the gardens of old European homes? 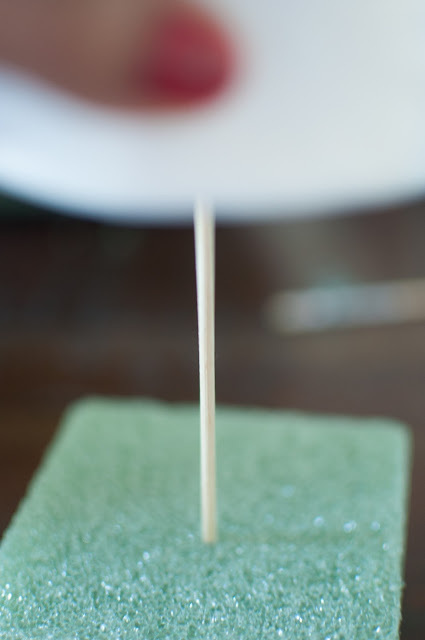 Today I'm sharing the results of my DIY garden sculpture ... and yes, it worked. 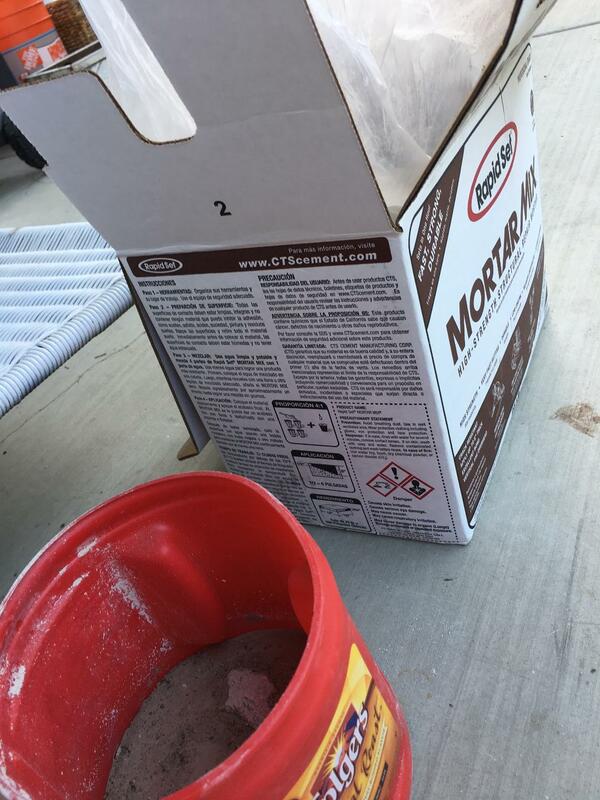 I actually tested out and confirmed that you can indeed put fast-drying mortar mix on to Styrofoam and get it to stick. Translation: you can do this too! To get my confidence going, I had to Google (what did we do before Google?) until I found someone who did a variation of what I wanted to do and saw the word "mud pies" to describe the consistency of the concrete, and I was off running to Home Depot to buy the product I was already familiar with. 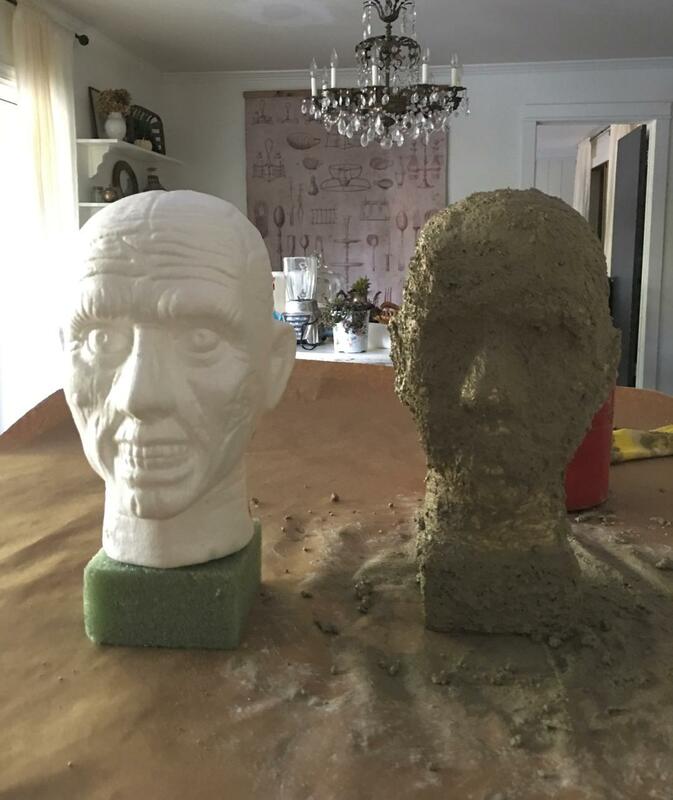 Next I had to find a Styrofoam 'sculpture' that I wanted for my two matching urns, and since it's so close to Halloween I decided to add a fun touch to my front door by using a head. 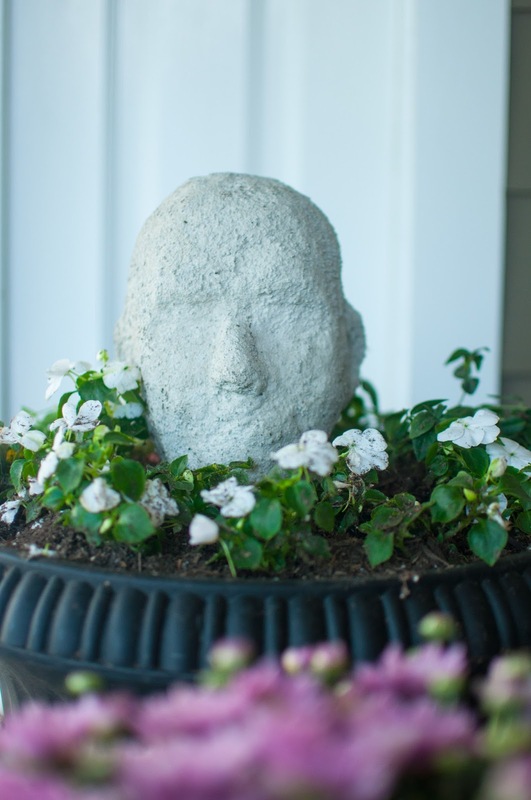 Yes, I imagined a Old World head coming out of my pretty flower-filled urn. How's that for a perfect little nod to Halloween? But here's the problem I faced. 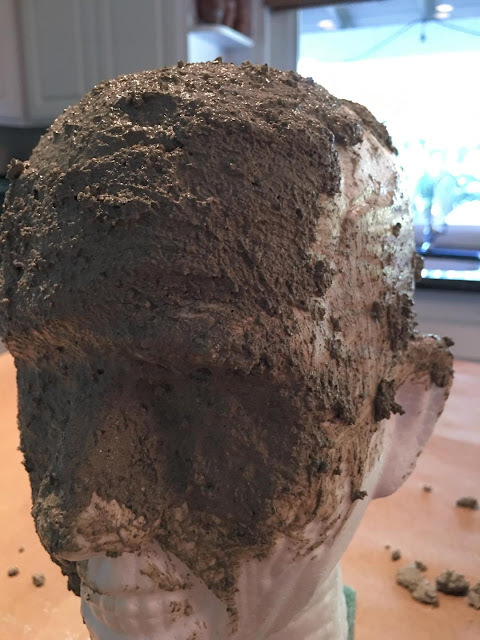 All the Styrofoam heads that are commonly sold in stores actually tilt to one side. I know. 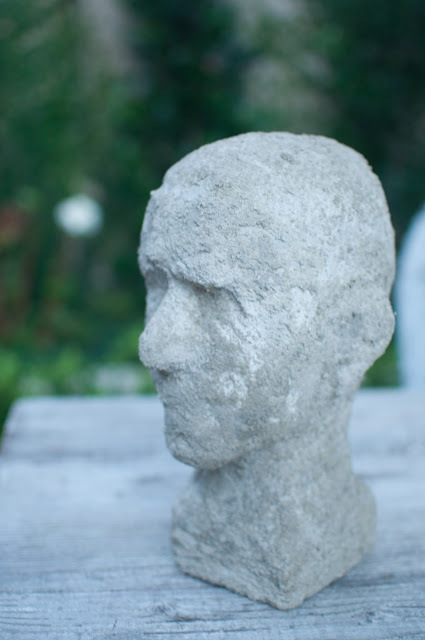 These are actually details I spend time thinking about, but back to my dilemma: a tilting head would not look right as a garden sculpture. 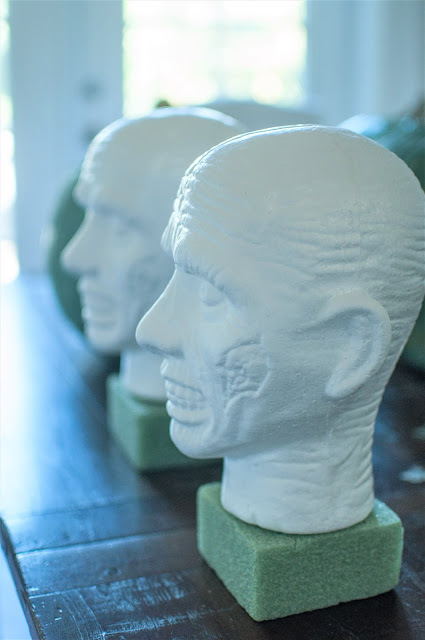 So I got on Google again, found the perfect male Styrofoam heads, calculated how much money it would cost to expedite shipping, and decided THAT option was dead. Unfortunately I was back to square one. With the tilted heads. I bought this additional Styrofoam block for the head to complete my "classic head form" and used a thin dowel to connect both. Ok, if you're going to do this make sure you wear gloves. I also kept the mortar-water mixture on the runny side while blending, then I could squeeze out the excess water if needed. Basically you work in layers. Keep squinting with the water bottle until the consistency blends with the previous layer. But I'll be honest, at his point I had the worst-sinking feeling when I took this picture. I was actually thinking, "OMG... is this going to work?!" And about now I'm thinking, "Michele's readers are gonna think I am SO nuts!" But heck, once I got started I was actually curious to see how it would turn out. 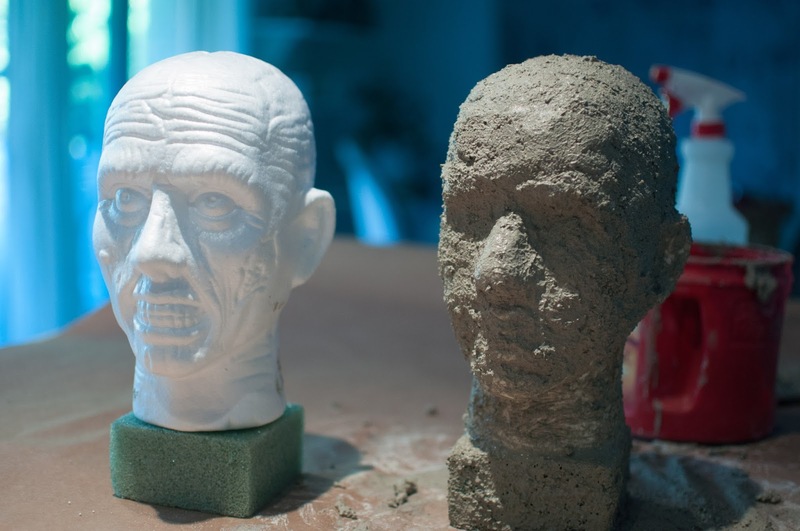 I got a light coat on the first one before I started slathering the second head with the mortar mix. The second head ended up being slightly more defined. I realized that first coat needs to be a really light one --almost transparent--before you add more layers. I used that water bottle to keep squinting it--it helps it cure a little more slowly although it was cool and damp outside and I wasn't too worried about it cracking. Here it is still wet. The next morning. Ta daaaa! Since I finished my heads I have stumbled on some ways to "age" new garden statues so they look even more authentic. If I had time I would try it. 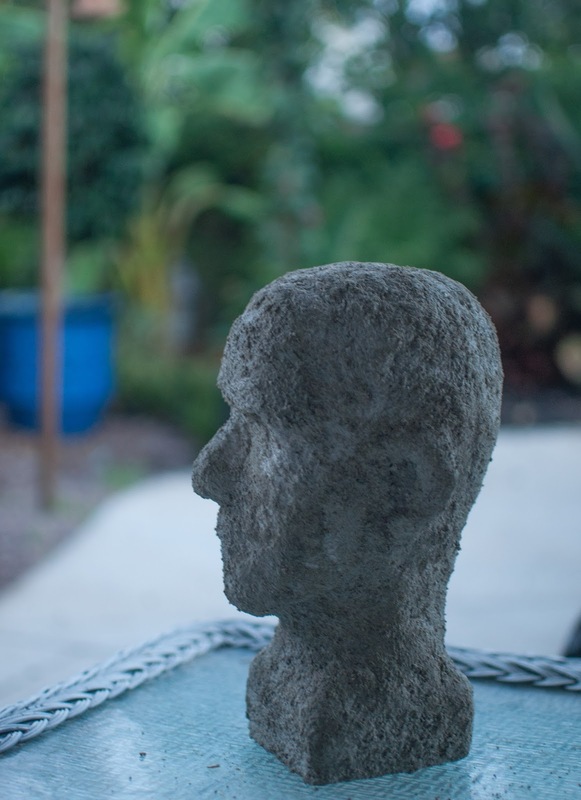 Meanwhile, here's a peek at these garden head statues in my urns. And here's a glimpse with my version of 'Old World' pumpkins too. Don't forget to check back with Hello Lovely Studio to see my entire front door reveal including the vintage French sign, I'm so happy with how it turned out. That turned out amazing Leslie! These are so fun, Leslie! They turned out great! YOU DO CRACK ME UP! WHEN DO YOU GO TO YOGA and HOSPICE? I hope HOME DEPOIT is giving you a DISCOUNT! They must KNOW YOU BY SIGHT!!!!!!!!!! DO YOU GET LOADS OF TRICK or TREATERS? LOL. What can I say Elizabeth? I'm a crazy woman ...but very fun to hang out with and even better with red wine coursing through my veins. We gotta get together! Why don't you and Cindy plan a blogger get-together soon? I have a call into HER this AM!!!!!!!! Ha!! You are so fun! Some people might call me crazy. LOL. Seriously thanks for always being so supportive, you guys need to come visit Southern California, I'd love to meet in person!! !